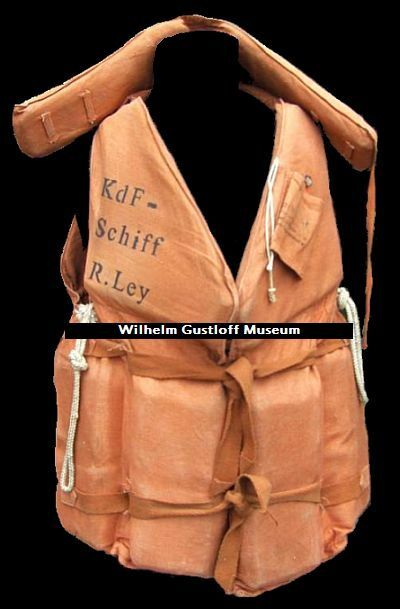 - Marked "KdF-Schiff R.Ley". Other markings shown below. Probably taken off the ship during a transformation, whether it be for a souvenir piece or another reason. Der D.R.K. Vorhelfer Alfered Evers Bremen Gauforst? 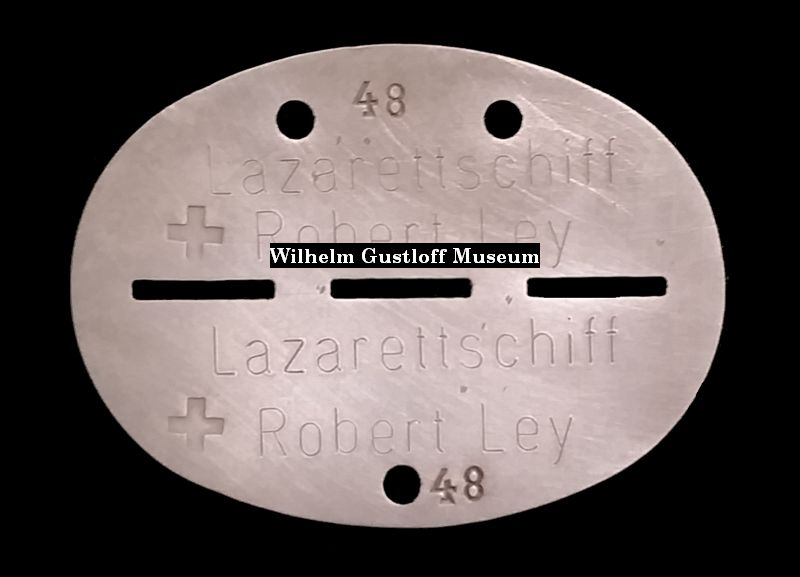 58 ist auf Grund des Notdienstgesetzes am 18.9.1939 auf dem Lazarettschiff "Robert Ley" einberufen werden. The D.R.K. Vorhelfer Alfered Evers of Bremen Gauforst? 58 has been assigned on the hospital ship "Robert Ley" because of the emergency law on 18/09/1939. Command hospital ship "Robert Ley"
Navy medical officer and adjutant. 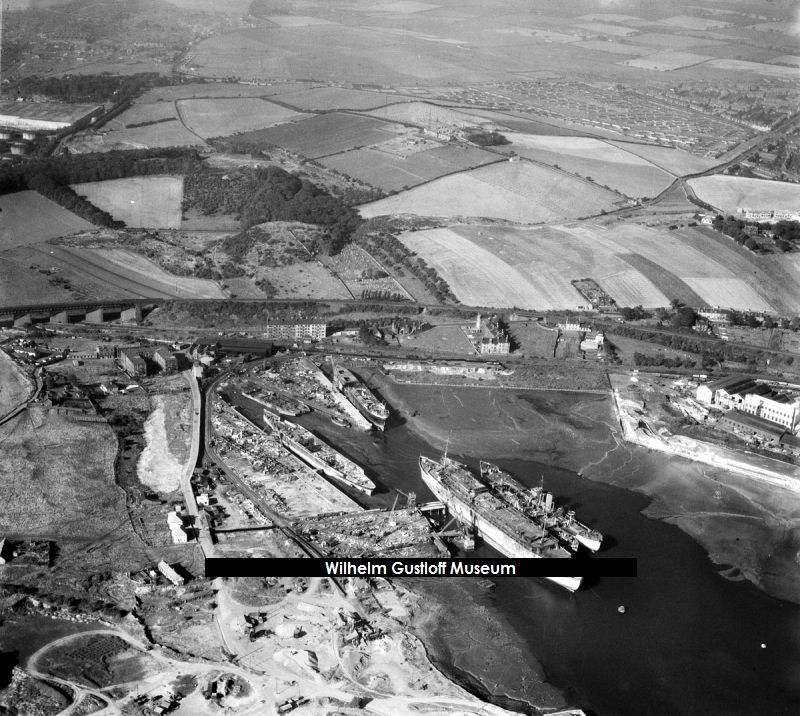 For the Ley being bombed, she looks in remarkable condition from the air sans the missing funnel. "Cruise Ship Reported Sunk. The 27,288 ton Robert Ley was sent to the bottom while transporting ​German troops across the Skagerrak. Berlin denies the British claim, but refuses to reveal the vessel's whereabouts. Above: The E.S. Robert Ley in color with her wartime camouflage paint. A great photo of the Robert Ley during the war showing her camouflage paint scheme. Her funnel is netted to give a different profile appearance and one of her lifeboats is missing. Note all of the ice in the harbor where she is berthed. While I do not own this photo, I found it a while ago while searching the internet. I have since sent some emails around trying to locate the original to obtain for the collection, but I never received any replies. If you happen to own this photo, please contact me at the email address on the introduction page. 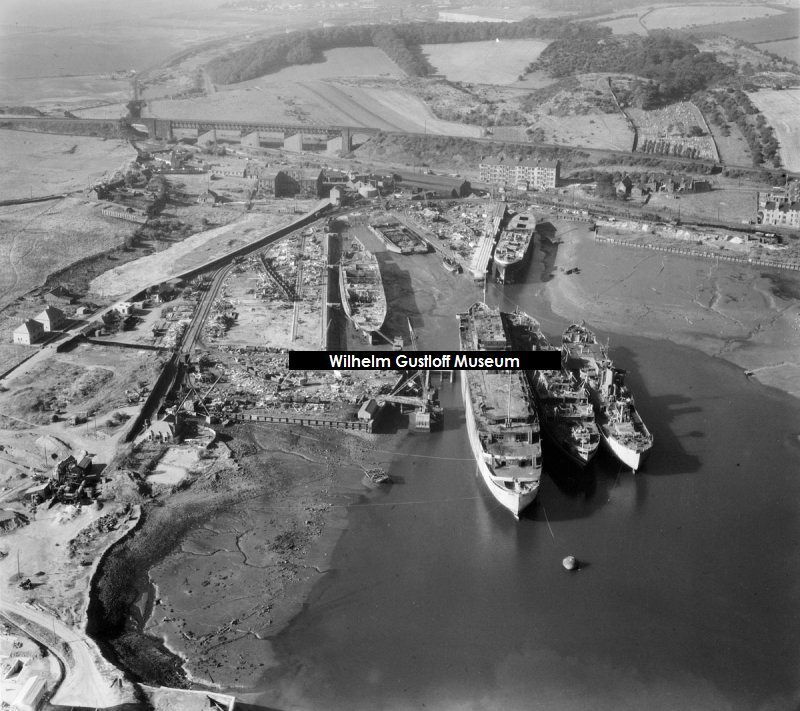 Far Left: Funnel of the Robert Ley in its camouflage at berth. Left:Forward port view of the Robert Ley in her camouflage. The KdF Ships Sail in the Hospital Service. 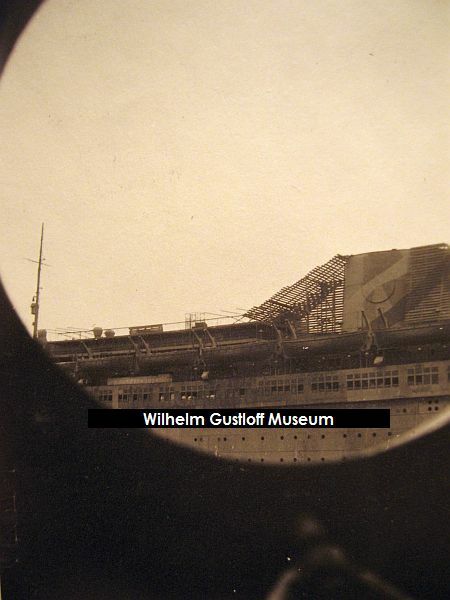 "Robert Ley" and "Wilhelm Gustloff" floating clinics. 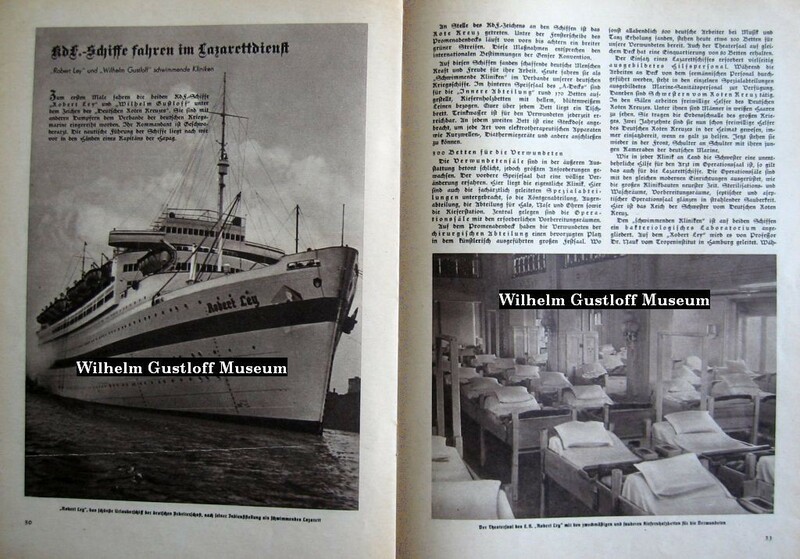 For the first time, the two KdF ships "Robert Ley" and "Wilhelm Gustloff" sail under the sign of the "German Red Cross". They have been intermarried with other steamers of the German Navy. Your commander is your squadron. The nautical management of the ships is still in the hands of a captain of HAPAG. First Caption: "Robert Ley" - the most beautiful holiday ship of the German workforce, after its commissioning as a floating hospital. Instead of the KdF sign on the ships, the Red Cross has entered. Under the window pane of the promenade deck runs from front to aft a broad green strip. These measures comply with the international provisions of the Geneva Convention. 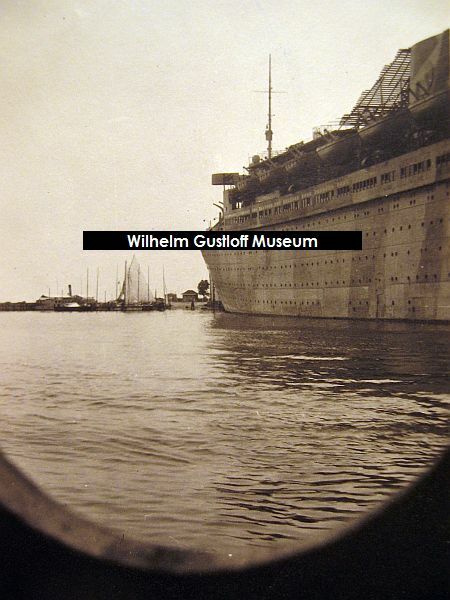 On these ships were German workers sailing with the Kraft durch Freude. Today, they go as war ships. In the rear dining room of the A-Deck, about 170 beds are laid out for the "interior" section, pinewood beds are covered with bright, white linen. There is a table board above each bed. Drinking water is always available for the wounded. Each second bed has a socket for connecting any type of electrotherapeutic apparatus such as shortwave, diathermy equipment and others. 300 beds for the wounded. In the exterior, the wounded rooms are extremely simple, but they meet the most demanding requirements. The front dining room has undergone a complete transformation. Here lies the actual clinic. Here, too, are the specialist departments, the X-ray department, eye department, neck, nose, ears and the jaw station. Centrally located are the preparation rooms. On the Promenade Deck, the wounded of the surgical department have a privileged place in the artistically executed grand prison. Where there were 800 German workers every day for music and dance recreation, about 300 beds are now available for our wounded. The theater hall on the same deck has also accommodated 80 beds. The use of a hospital ship requires versatile support personnel. While the work on the deck is provided by the individual special departments trained naval sanitary personnel. In addition, sisters from the Red Cross are active aboard. Volunteers of the German Red Cross work in the halls. Among them are men in white hair. They wear the Order of the Great War. For two decades, they have been volunteers of the German Red Cross in the homeland, always ready to help when they need help. Now they are back in the front, shoulder to shoulder with their young comrades of the German navy. As in every clinic on land, the nurse is an indispensable aid to the doctor in the operating room, so does the same for the hospital ships. The operating systems are equipped with the same modern facilities as the large clinics of modern times. Sterilization and washrooms, preparation rooms, septic and aseptic operating rooms glow in radiant cleanliness. Here is the realm of the sister of the German Red Cross. The "Robert Ley" is headed by Prof. Dr. Nauk from the Tropen Institute in Hamburg, Germany. While the wounded transport of this laboratory is restricted to the severely injured with rapid blood loss or infections by means of effective counter-measures, this important station also carries the responsibility for the health monitoring of our soldiers par excellence. Detected vector carriers are excreted immediately. Thus the effect of a "hospital to the sea", depending on the use of the actual activity on the water in the union of the Kriegsmarine, extends occasionally also on the troops on land. An important activity of the bacteriological laboratory during the transport of injured persons on board is the determination of blood groups. This action makes the immediate home slaves the fastest workers. Also with every member of the ship's personnel is his blood group determined. In particularly serious cases, these healthy blood-vessels are taken for the purpose of blood-transfer. "If you want pills or drops, please knock on the window." This humorous verse is read at the counter of the exemplary pharmacy. All the chemicals and drugs, as well as the scientific ones, are given the necessary dressings. The dehumidifying chamber works with an electric hot air process at 100 degrees, enabling the disinfection of all consumer goods such as clothes, washing, footwear use. Those who were able to gain a comprehensive insight into these unique Lazarettships will be given the assurance that exemplary work will also be done in the field of wounded care, and that the wounded soldier will be given care and care which will restore him to health in the shortest possible time. Caption #2: A wounded on the transport to the "swimming clinic." Caption #3: With a very motherly love, our never-ending Red Cross Sisters also take their place on the E.S. Robert Ley the wounded. The Robert Ley left Danzig after having been a hospital ship for only 9 months. She sailed to Pillau on the first week of May, 1940 and arrived around the 5th of May. 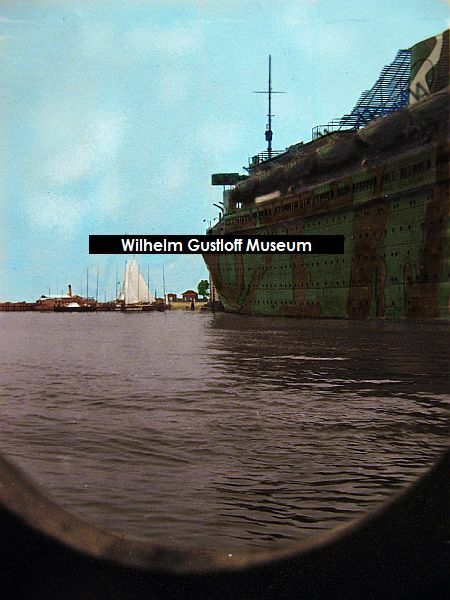 Almost immediately, she began serving as an accommodation liner for the 1.Unterseeboot-Lehr-Division, Neustadt and the 21.U-boot Flotilla, Neustadt. 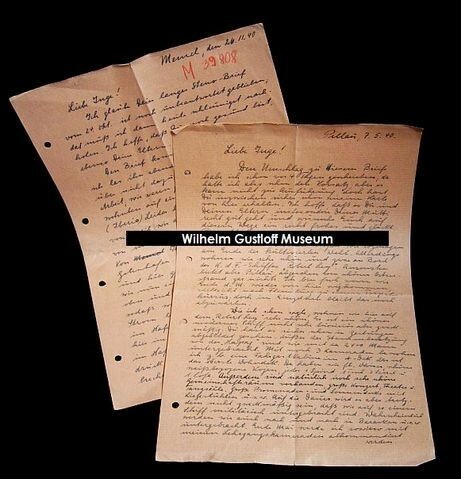 The collection has two letters written by Hermann to Inge. 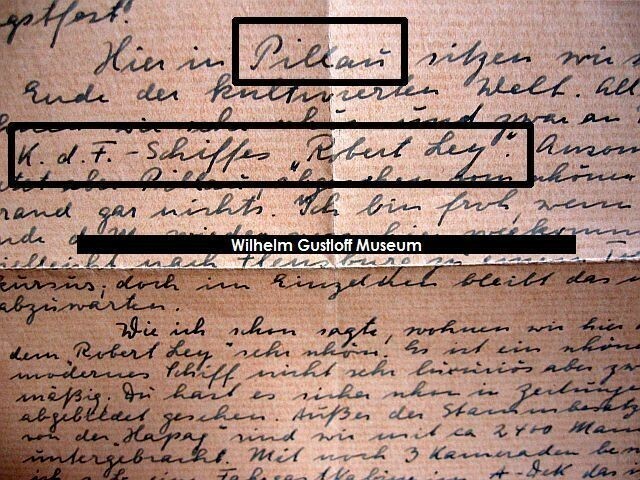 The first written on May 7th, 1940 where he tells Inge, "Here in Pillau, we are, so to speak, the lead of the cultivated world. However, we are already aboard the KdF ship Robert Ley..... As I said, we live here on the Robert Ley already! 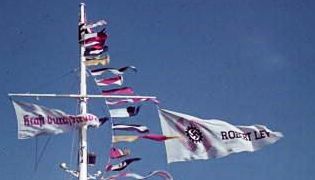 It is a beautiful modern ship - not very luxurious, but functional." In June of 1941, the Robert Ley was camouflaged in dazzle paint - designs painted on her hull to distort her appearance and size. She also had netting placed across her funnel to change its appearance as well. After that point, she was serving as an accommodation liner and remained in Pillau for nearly the next 4 years. 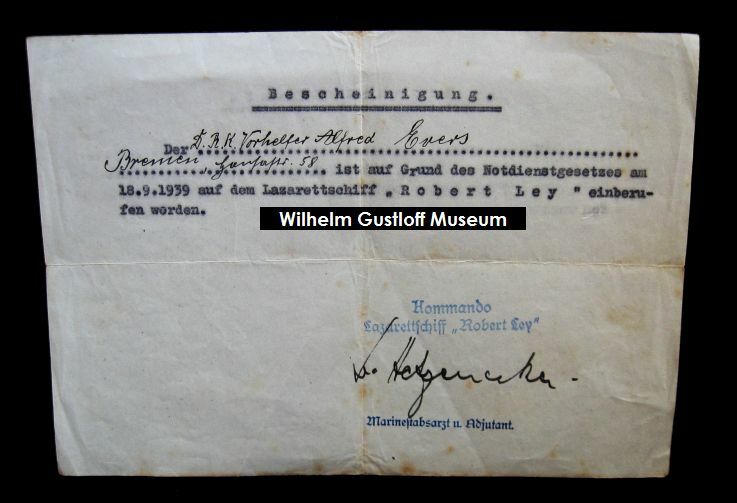 On July 29th, 1944, she served as a VTS - Verwundeten TransportSchiffe - transporting sick and wounded troops during evacuations, though her destinations are currently unknown. Then on September 9th, 1944, she served as an accommodation liner for the 1.Unterseeboot-Lehr-Division / II. Abteilung, Hamburg-Finkenwärder. 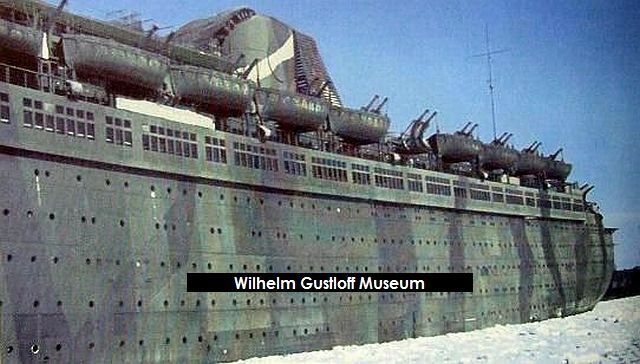 It is known that she also docked in Gotenhafen with the Wilhelm Gustloff during Operation Hannibal, but any 1941 -1944 sailings between Pillau and Gotenhafen are not known. During Operation Hannibal on January 25th, 1945, she departed Pillau with the liners Pretoria, Ubena, and Duala. She stopped in Gotenhafen with 8,000 to 10,000 refugees on board before sailing 5 days to Stettin. How many additional trips she made before the Red Army cut the ports off is also not known. ​​It is believed that once her evacuations were completed, and not being able to return to Pillau, the Ley sailed back to Hamburg to await her fate. Photos 1-3: Postcards sent from the ship as an accommodation liner. On March 9th, 1945, the RAF made a bombing run on Hamburg Harbor, specifically to target Blohm + Voss, with 312 aircraft of Squadron No. 466. 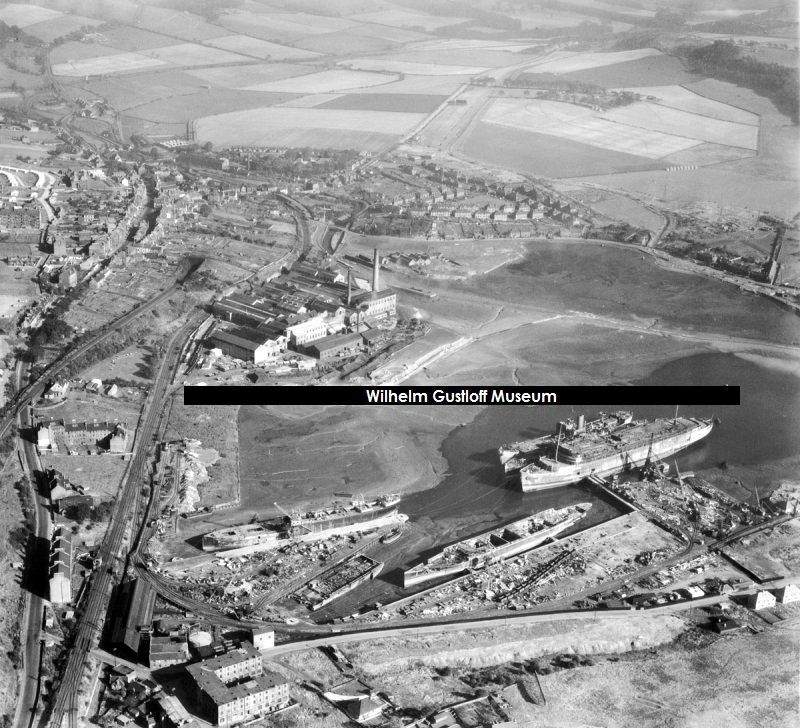 Their main target was to attack the new XXI U-Boats being built there, and in the process they managed to find a large passenger liner in camouflage at berth. The Robert Ley was said to be housing refugees at the time of the attack and was hit by the bombs of the RAF. A fire engulfed the former flagship of the KdF and she sank at the pier where she remained until after the war. Video stills from a movie showing the bombed out ships in Hamburg Harbor in 1946. The full original video can be seen HERE courtesy of Framepool.